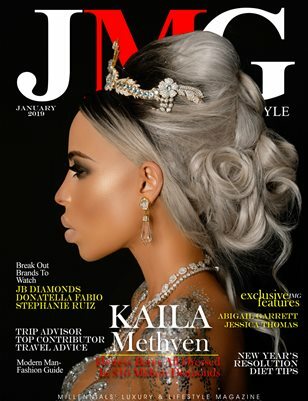 JMG Lifestyle Magazine New Year 2019 with Kaila Methven KFC Chicken Heiress and Fashion Designer CEO. This fashion maven bares all in our latest issue wearing only 10 million dollars’ worth of sequenced diamonds and stunning 3 million-dollar Versace crown. Check out excusive images and our interview where she shares with us advice on how to avoid distractions, daily rituals and her biggest influences. Also, Trip Advisor Top Contributor offers travel advice, an Inspirational Modern Man Fashion Guide, New Year’s Resolution Diet Tips to help you stick to your 2019 diet goals, and much more! - Get your free digital copy! Link in bio. Also be sure to drop by JMGLifestyle.com for more amazing content.